“Katharina Hinsberg draws abstract drawings in pencil, on simple sheets of paper. And she cuts the drawings from the paper, with the aid of scalpel. Finally she hangs the sheets with the empty spaces on the wall. 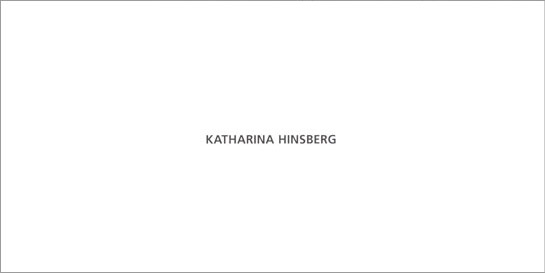 Katharina Hinsberg was born in 1967. She lives and works at Raketenstation Hombroich/Neuss close to Düsseldorf and in Wien. She studied at the Academies of Munich and Dresden and at Ecole des Beaux Arts at Bordeaux. 2000 she was Artist in Residence at Chinati Foundation, Marfa, Texas. Katharina Hinsberg exhibited at many German Kunstvereinen and museums, as Kunstverein Freiburg and Kunstmuseum Bonn.